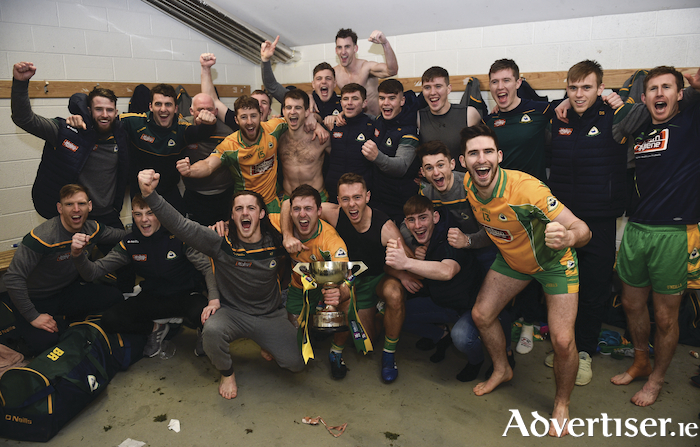 Corofin players celebrate in the changing room following the AIB Connacht GAA Football Senior Club Championship final match against Ballintubber at Elvery's MacHale Park in Castlebar, Mayo. Photo by David Fitzgerald/Sportsfile. Most pundits expected Corofin to make it three in-a-row of Connacht titles last weekend in MacHale Park, and they did just that, defeating Mayo champions Ballintubber on a score line of 2-10 to 1-9. While that four-point victory appears comfortable enough, Corofin did not have it their own way for long periods of the game. Many GAA observers were not expecting it to be so tough for the All-Ireland champions and they were second best in many regards for the entire first half and were 1-05 to 1-02 behind at half time. And it could have been worse only for some wayward Mayo shooting. Corofin again struggled initially to break down a defensive team and looked very flat in the early stages of the game, however as the proved in last minute of the drawn county final against Mountbellew/Moylough – they do not do panic. Ballintubber got by far the better start to the game and led by 0-4 to 0-1 after just 10 minutes. However despite being a bit rattled and there being a definite nervousness in the stand from Corofin supporters at their lacklustre start, the players inside the white lines always continue to do the simple things and believe in the system and their own abilities. There was never any sense of panic from the Corofin players and they just stuck to doing what they do best. Even with All-star Ian Burke not being able to start the game through illness, they continually tried to play the Corofin way, with quick passing, overlaps, non-stop movement, and that constant movement finally paid off for them with an impressive second-half performance. All the 21 players who saw action for the champions know how to play the system intuitively and the changes were seamless as regards their style of play. With the experience of Burke, Conor Cunningham, and Barry O’Donovan and with three younger players Dylan McHugh, Dylan Canney, and Darragh Silke all playing some part in the game, Corofin showed that they have some strength in depth. Corofin never panicked despite looking very lethargic in that first half and the small whistle came just when they needed a chance to regroup and refocus on the task at hand after conceding 1-1 near the end of the half – almost immediately after getting themselves right back into the game from a great goal by Michael Lundy. Kieran Fitzgerald, or “Fitzy” as he is known to every GAA fan in the county, showed yet again that he is still a quality full back capable of doing a man-marking job on some of the finest of footballers in the country. Understandably a man who won an All-Star back in 2001 did struggle at times, most notably in the first 10 minutes when Cillian O’Connor scored two top class points from play. However, after that he was restricted to just two scores from frees for the next 50-odd minutes. Even at the age of 37 – Kieran turns 38 on New Year’s Day - and with numerous titles won over a glittering career - unless there is really high quality ball being kicked into space to the inside forwards who can outpace him - then Fitzgerald still has the hunger and power to win more than his fair share of ball and put his team on the front foot as he clears the danger with assurance. Obviously Ian Burke made a massive difference for Corofin when he came on, as you would expect from a player of his calibre - finishing as the top scorer with 1-1, however wing-back Kieran Molloy will soon be one of Corofin’s most important players if he produces many more displays like last Sunday. How many times in every game do we see him running forward with possession? Being the ball carrier from the half back line to the half forward line, linking up the play and taking on his man, however, on Sunday there was even more. There were a few superb interceptions with some great tackling and a super point from play which was the cherry on top of one of his finest displays yet in a Corofin jersey. Ian Burke got the Man of the Match award on TG4 and his involvements after his introduction could easily be said to have been what won Corofin the game – however Molloy had a greater influence over the full 60 minutes. Following another provincial title Corofin must now wait over two months (February 16 2019 ) to play their all-Ireland semi final against either Scotstown (Monaghan ) or Gaoth Dobhair (Donegal ). Such a long delay in getting the club championship finished again brings up the question as to why the club championship cannot be finished within the calendar year and give players a break before it all starts again for them - especially the ones doubling up for their counties too.